The Briarhopper show originated about 1935 as a way to pitch patent medicine. Consolidated Drug Trade Products of Chicago asked WBT to create a program to sell its Peruna tonic, Radio Girl perfume, Kolorbak hair dye, and Zymol Trokeys cough drops. WBT decided that stringband music and country humor were the way to reach the rural and working-class audience of the piedmont textile region, and they chose their young, warm-voiced announcer Charles Crutchfield to head up the show. Crutchfield had started in radio at station WSPA in Spartanburg in 1929. 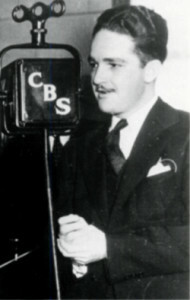 After a stay at WIS in Columbia as announcer, Crutchfield joined the staff of WBT in 1933. He organized the original Briarhopper show, bringing together Johnny McAllister, Jane Bartlett, Bill Davis, Clarence Etters, Thorpe Westerfield, Homer Drye, and Billie Burton as its founding members. Crutchfield’s wit contributed greatly to the show’s success. His programming and business savvy soon landed him the spot of program director, then station manager for WBT. He eventually became president of WBT’s parent company, Jefferson-Pilot Broadcasting. The name “Briarhopper,” says Crutchfield, came to him one day when he was out rabbit hunting with friends. They flushed a rabbit from a thicket and someone exclaimed, “Look at that briarhopper!” Musicians Cecil Campbell and Harry Blair, early Briarhoppers who came to Charlotte in 1934 with the Tennessee Ramblers band, offer another explanation. They remember that the Ramblers had used “Briarhoppers” as a pseudonym whenever they needed to avoid contractual conflicts in their pre-Charlotte days. Scholars point out that the term was also slang for Kentucky migrants at the time. Early stringbands had a penchant for turning such terms—hillbilly, tar heel, fruit jar drinker—to their advantage. However the name came to be, WBT listeners quickly took it to heart. Over the years, the Briarhopper organization has included dozens of musicians. WBT country artists acted like members of a big club, rather than competing musicians. At various times a musician might play with the Briarhoppers, Tennessee Ramblers, Crazy Bucklebusters, or occasionally two bands at once. At the height of the Briarhoppers’ fame there were even two touring versions of the band, dubbed Unit One and Unit Two, crisscrossing the Southeast playing mill villages and courthouse towns. Many of the early Briarhoppers went on to careers as soloists or group leaders including Fred Kirby, Claude Casey, and Cecil Campbell. One of the most important of the early Briarhoppers is “Big Bill” Davis. Davis is a classically trained violinist who performed with the Charlotte Symphony, but who doubled as a country fiddler and bass player. He formed a stringband called the Cotton Blossoms in the late 1920s which was certainly among the very first country groups to broadcast on WBT. He was a regular on the Briarhopper show for many years. The Briarhoppers hit their peak of popularity in the 1940s. During the summer of 1945,WBT originated Carolina Hayride, a Saturday afternoon barn dance broadcast coast-to-coast via the CBS radio network. It starred the Briarhoppers along with Fred Kirby, guitarist Arthur Smith, and other Charlotte country notables. The Hayride was succeeded by Carolina Calling and Dixie Jamboree, similar programs that were aired throughout the 1940s over much of the Southeast on CBS’s Dixie Network. At their height, the Briarhoppers’ old-fashioned blend of breakdowns, hymns and heart songs could draw up to ten thousand pieces of fan mail in a single week. 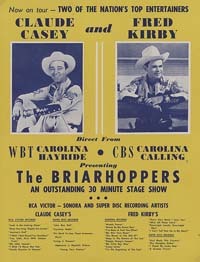 The Briarhopper show ended its run on WBT in 1951, a victim of changing public tastes in country music. Many of its alumni retired from performing, but in the 1970s the band regrouped with Whitey and Hogan, Don White, Shannon Grayson and Hank Warren. Don White was a member of the original band from 1935 to 1939, and also for a second stint in the early 1940s. Born Walden Whytsell in the West Virginia mountains in September of 1909, he learned to sing hymns and play guitar from his mother. He first visited Charlotte in 1933 with the Blue Ridge Mountaineers, but did not settle here until 1935 when he arrived with the Crazy Bucklebusters (a Crazy Water Crystals Barn Dance band) and stayed on to become a Briarhopper. 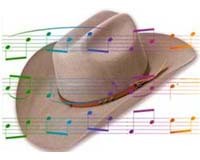 Cowboy tunes and old-fashioned heart songs are his love, and he made his RCA recording debut here on June 19, 1936 singing such songs as Mexicali Rose, What a Friend We Have in Mother, and a duet with Fred Kirby My Old Saddle Horse is Missing. 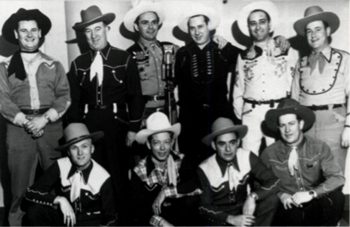 During the 1940s Don White journeyed to Hollywood with the Tennessee Ramblers to appear in a number of cowboy movies. The high point of his career came in 1946-1952 when powerful WLS Chicago made Don White and the Sage Riders featured performers on its highly popular National Barn Dance heard throughout the Midwest. Shannon Grayson on banjo hails from Sunshine, North Carolina. Born September 30, 1916, he started his career playing mandolin and guitar for Art Mix, brother of cowboy movie star Tom Mix. In 1937 he began working with western singers Bill and Cliff Carlisle. They played on radio in Charlotte, Knoxville, Asheville, and Charleston, West Virginia, and recorded frequently at the RCA sessions in Charlotte. In 1943 he left to join the WBT Briarhoppers and remained with them for most of their network years. At the end of the 1940s he struck off on his own as leader of the Golden Valley Boys, an early bluegrass group which recorded for RCA. “Fiddlin’ Hank” Warren (his first name is really Garnett) has long been one of the most versatile of the Briarhoppers. Born in Mount Airy, North Carolina, April 1, 1909, he got his start winning fiddlers’ contests as leader of Warren’s Four Aces. Like Don White, he spent time with the Blue Ridge Mountaineers and the Tennessee Ramblers. He recorded with the Ramblers at the Charlotte sessions and appeared with them in the 1936 film, Ride Ranger Ride starring Gene Autry. He joined the Briarhoppers in the early 1940s and became not only their fiddler, but also their baggy-pants comedian. Photos of the band from that decade feature Hank—made up with freckles, fake glasses and blacked-out teeth-cutting capers with his fiddle or even standing on his head. Few listeners realized that he had enough formal training to play with the Charlotte Symphony, or that his skill at sight-reading allowed him to act as the Briarhopper musical director during the busy days following World War II when composers deluged the band with song sheets. After the Briarhoppers went off the air, Hank became chief photographer for WBTV, and his work files have proved an important resource both for that corporation and for historians. Roy Grant and Arval Hogan form the duo “Whitey and Hogan” within the Briarhoppers, and historians at the Country Music Foundation have declared them country music’s longest-running duet. Grant was born in Shelby, North Carolina, April 7, 1916, and Hogan was born on July 24, 1911 in Robbinsville, North Carolina. Like many other young men and women raised in the piedmont Carolinas they went to work in the textile mills. It was in 1935 at the massive Firestone Mill in Gastonia that they met and began playing together as the Spindle City Boys. Whitey and Hogan made their radio debut on WSPA Spartanburg, then became regulars on new WGNC Gastonia in 1939 where they broadcast from the main street show-window of a sponsoring furniture store. Decca Records brought them to New York for their first recording session late that year. In 1941, they joined the WBT Briarhoppers in Charlotte, and were featured vocalists with the band until it broke up in the early 1950s. Today in 1985 the Briarhoppers are performing once again, and recording for the Lamon and Old Homestead labels. They have a busy schedule of bluegrass festivals all over the Southeast, and recently travelled to St. Paul, Minnesota, for a guest appearance on public radio’s hugely popular Prairie Home Companion. Since 1978, school children in North Carolina have been treated to the Briarhoppers as part of the “Folk Arts in the Schools” program sponsored by the North Carolina Arts Council. Students who ordinarily listen only to pop idols on a.m. radio are spellbound by the Briarhoppers’ music and humor, and clamor for encores and autographs. The Briarhoppers continued to evolve after the preceding essay was penned in 1985. Fiddlin’ Hank Warren and Shannon Grayson died not long following the Charlotte Country Music Story concerts. Longtime Carolina fiddler Dwight Moody, owner of Lamon Records, stepped in along with David Deese on banjo, whose previous accomplishments included replacing Bill Keith for a year-long stint with Bill Monroe’s Bluegrass Boys. In 2010 Roy “Whitey” Grant became the last of the 1930s-40s Briarhoppers to pass away. A version of the band continues, sanctioned by WBT, led by Briarhopper researcher Tom Warlick (see below). A 1946-47 edition of the Briarhoppers with Whitey & Hogan, Fred Kirby and Don White recorded for Sonora under the name The Carolina Playboys. That material is available on the German label Cattle Records: The Carolina Playboys Sing and Play Country and Western Classics (CCD 253). The 1980s – 1990s Briarhopper line-up is preserved on several Lamon CDs. Tom and Lucy Warlick’s book The WBT Briarhoppers: Eight Decades of a Bluegrass Band Made for Radio (McFarland, 2007) and accompanying website WBT Briarhoppers offer a thoroughly researched exploration of the group’s history, members, and current exploits. In 2014 Daniel Coston published his memories of the band: The Briarhoppers: The Circle Rolls On. See also the website BT Memories.